It's no secret our love of a good Dark n' Stormy - we've mentioned a couple here but a pitcher version grabbed my attention recently in Better Homes & Garden (can't find the link online to the exact recipe but the ingredients were sweet vermouth, lime juice and ginger beer) but I riffed it a little more. This was for four people and we had the pitcher gone before I even thought of taking a picture. Alas, no picture of the pitcher. Add all the ingredients in a pitcher except the ice and stir. Pour over ice filled glasses. ... sour cherries, those small, bright red spheres most often found at farmers’ markets and the best cherries for pies. They’re too tart to eat raw, but they mellow considerably when cooked — or muddled with sugar and bathed in whiskey. Muddle cherries, sugar and lemon peel in bottom of glass, fill with ice, add the whiskey and stir well. We've developed a tradition of enjoying a traditional meal and/or beverage when watching the opening ceremony of the Olympics (here and here) and we'd hate to feel like we neglected the World Cup in this - but rest assured I've been muddling limes to beat the band since it started last week in Brazil. This drink has been featured here before but no matter - it's so good we posted it twice. Muddle the sugar and the lime in the bottom of a cocktail shaker or glass (even better if you have a Brazilian hardwood muddler! 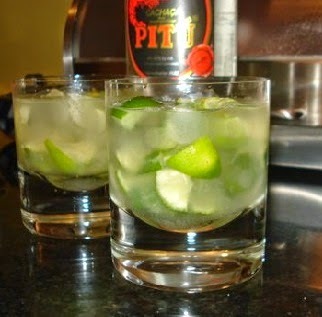 ), add the cachaça and ice and shake before pouring into a chilled glass. Tournament's already off to a great start - may the best team win and all the referees be fair. I liked the Spring Apparent so much I wanted to see what it would be like if I added a little more pastis (1/4 oz) and added some more ice and club soda to it would it make it get cloudy like just plain pastis and water. And guess what? It did!